Lavishly Fitted Suites. 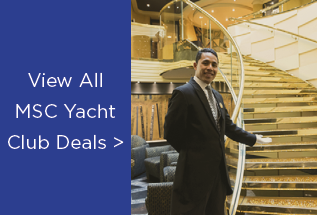 Superior decor, larger suites and beds laced with Egyptian cotton sheets, a memory foam mattress and a choice of pillows ensure a great night’s sleep in your Yacht Club Suite and the complimentary mini bar provides round-the-clock refreshment. Dedicated Private Restaurant. 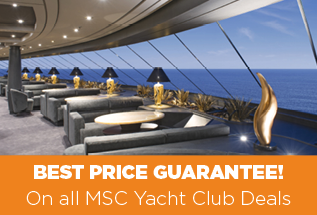 MSC Cruises is renowned for the quality of their cuisine and the MSC Yacht Club is no exception. All serving delicious first class menus ranging from the healthy to the superbly indulgent, that allows you to dine at leisure. Priority Check-In/Check-Out. Check-in with your own personal Butler who whisks you off to your suite. Your baggage arrives exactly when you do. 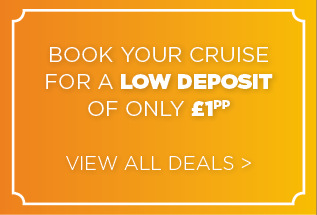 You also disembark the ship first for excursions as well as on the final day. 24 Hour Butler Service & Concierge. The 24-hour Butler and Concierge service in the Yacht Club are there to assist you in any way possible, at any time. “MSC Yacht club has proved to be an amazing experience, an Orchestra of fine players conducted by the truly incredibly talented Dani Agung Sri Presetyo. 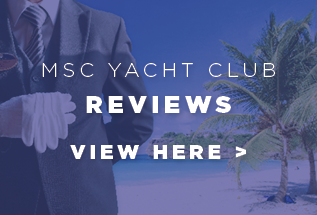 It is clear to see that Dani is constantly managing a wide range of matters on board, and his versatility and professionalism is a credit, and have absolutely made our experience with MSC truly memorable.” - Ms. Raynolds, fourth time yacht club guest. The Yacht Club was the most fantastic experience imaginable that made our holiday one we will always remember. Its hard for us to explain how fantastic it was to someone who has never experienced it. From the moment we checked in to the Hilton Hotel at Gatwick it was five star all the way. Checked the bags in the evening before the flight to Barbados, next time we saw them they were in the cabin on the ship. On arrival in Barbados our transfer from the plane to the ship was seamless. On board the ship was incredible. You cannot be treated any better. You cannot have better service or better facilities anywhere. You were made to feel very special and it wasn’t false in anyway. - Ms. Keigan, first time yacht club guest. You cannot be treated any better. You cannot have better service or better facilities anywhere. You were made to feel very special and it wasn’t false in anyway. The spacious cabin with balcony, bathroom with a bath,walk-in wardrobe and complimentary mini bar that was continuously restocked. The cabin was cleaned twice a day. Bedding changed every day. Immediate room service. Personal butler service. Fresh fruit everyday. Daily newspaper. Apart from complete access to all areas of the ship the Yacht Club offers a haven of a private sun deck with ample space and sun lounges. Mr. Janer - first time yacht club guest.